Overall – it saddens us to say that Jesus is a disruptive influence in the class. He flouts uniform regulations by turning up in sandals. He chooses his friends unwisely. Another report was found by Monty Python. Biology – 28% – weak, thinks he knows it all. Constantly rude about Darwin. Domestic Science – 54% – a useful cook, the pillar of salt will come in handy for a long time. Games – will not row, hates games and once parted the waters of the swimming pool during a match against the old boys which was both unsporting and dangerous. He can still do press ups. Progress and conduct: “I am afraid that I am severely disappointed in God’s work. He has shown no interest in rugger, asked to be excused prayers and moves in a mysterious way. His attentions to the carpentry teacher’s fiancée caused her to leave a term early, and there are several nasty rumours flying around. Here’s trouble and an affront that we overlook at our peril. This is challenging behaviour. His mother was no better. Her song (from Luke’s songbook and gospel), Luke 1:46-55, aka Magnificat, was banned for many years. The authorities in British ruled India, and in 1980’s Guatemala and Argentina banned the words from being read out loud because they were too revolutionary. Mary knew that Jesus was not good news for everyone. For every blessing that she sang there was an answering curse on those who thought they had it all. She sang of the one who looks with favour on the lowly, and who scatters those who are proud in their innermost thoughts, the one who lifts up the lowly, but brings down rulers from their thrones, who fills the hungry with good things, but sends the rich away empty. Woe betide us if we become proud, rich and powerful. According to her song, we will be scattered, brought down and sent away empty. Mary too is disruptive and dangerous for the authorities. It is no wonder that she is silenced by the authorities from time to time. Jesus takes after his mother and father. Blame the parents, if you like. 50 years ago, this weekend, three young men went to investigate a church that had been burnt out. The church was Mount Zion Methodist Church in Neshoba County in Mississippi. This was a building that was being used to register black voters in the States in what was called Freedom Summer, 50 years ago, in 1964 in the civil rights movement. The state authorities were bitterly opposed to the voter registration campaign, believing that blacks shouldn’t be able to vote. You can feel the authorities bristling with the arrival of these three men: Michael Schwermer, James Chaney and Andrew Goodman. The authorities were sheltering the culprits of the chapel burning. Their crime was about to be exposed by these men who had come to disrupt their peace. Deputy Sherriff Cecil Price followed the men as they drove back to their home in Lauderdale County. He intercepted them just on the county line and ordered them into his car. He then drove them to a deserted piece of land where they were met by two cars full of Ku Klux Klan members. They beat, shot and killed the three men, 50 years ago this weekend, June 21st 1964. The lives of the three are commemorated in a stained glass window in the chapel of Cornell University. Their faith is celebrated in the words of the gospel song made famous by Pete Seeger and Joan Baez – “we shall overcome”. Are they martyrs for us? Or were they disruptive and dangerous? What do we think? Are we on the side of the Klansmen, or the poor of the earth? Those three didn’t bring peace. Neither did they bring a sword. They brought beatings, shootings, burnings and violence. They didn’t bring those things themselves. They brought those things on themselves. They engaged the powers and suffered their might. 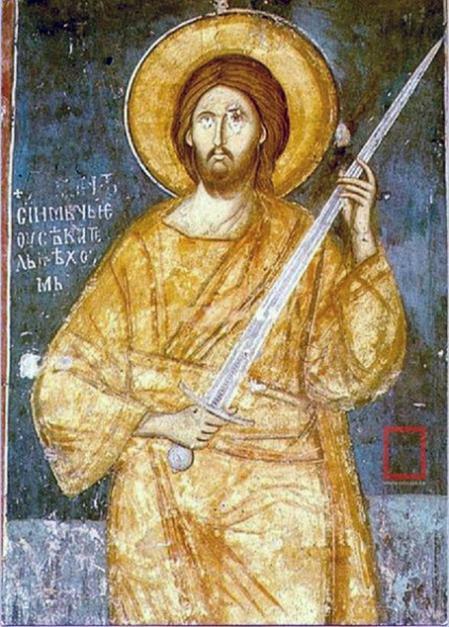 Does this help us to understand what Jesus said when he said, “I didn’t come to bring peace, I came to bring a sword”? In the cold light of day these words strike us as difficult. They challenge us and disrupt us. The more we burn with passion, the hotter we get under the collar, the more our hearts burn within us, the more understandable they become. No, Jesus comes with a sword. He is disruptive and he is divisive. The authorities expected him to go one way, and he went the other – to the lost, the last and the least. His words were salvation to some, but offensive to others. The words of Mary’s song provide commentary on Jesus as well as his father: he looked with favour on the lowly, and scattered those who are proud in their innermost thoughts, lifting up the lowly, while bringing down rulers from their thrones, filling the hungry with good things, while sending the rich away empty. He never used the sword. The sword is metaphorical. It is an effect. The sword is what happens as a consequence of his love. People turn on one another and on him. Even families and friends turn against each other. He is disruptive and unsettling for us all. When Jesus said “I haven’t come to bring peace, but a sword” he was preparing his followers for mission, so that they might be disruptive in a world crying out for disruption. He was preparing them for a dangerous mission which could bring disruption, persecution and even death. What is true of Jesus is true of the church. Just some times we have to stand against the crowd – like those who were conscientious objectors in the war 100 years ago, like those who protest when they see injustice being done, like when we side with the scapegoat, the sick, the prisoner, the stranger. It just might be that we have to stand alone – our friends may desert us, our families may turn on us, we may lose our cherished place in the community. We stand for love and we overcome evil with good. We can’t pretend there is peace where there is none. We haven’t come to bring peace, but a possible sword on ourselves. So I wonder what it will say on my final report. Will it say that I have been a troublemaker? Will it say that my behaviour has been challenging? Will it say that I have been disruptive for the sake of those who suffer in the way things are? Or will it say, “he was just nice”? What good is that, only being nice? Being nice just doesn’t cut it does it? Thanks to http://www.pleacher.com/forwards/forwards/jcreport.html for Jesus’ school report. Thanks to http://www.churchinacircle.com/2013/12/29/marys-subversive-song/ for the ideas about Mary’s subversive song. Posted in sermon.Tagged 1964, Andrew Goodman, Ashton Hayes, challenging behaviour, civil rights, Cornell University, disruption, Freedom Summer, James Chaney, Jesus, Magnificat, Mary's Song, Matthew 10:34, Michael Schwermer, school report, sword. Thanks for this. These hard words are so often sidestepped, the contradiction between words and action left unaddressed. The call to disrupt is deeply uncomfortable for most of us – but not as uncomfortable as leaving the imagery of that gospel reading hanging in the air without giving it a context in our lives. I really value being able to read this today. Thanks for the reblog Ivon. Much appreciated. I can’t see that we would treat Jesus any differently today than we did then.